The Xuma Clear Screen Protector Kit for iPhone 6/6s includes two precision-cut films designed to adhere to the touchscreen of your device to guard against dirt and smudges. The film features a scratch-resistant coating to protect against fingerprints and smudges. The transparent film maintains full image clarity. While applied, it won't interfere with the responsiveness of the touchscreen. The film features a glue-free static backing for an easy application and removal. Additionally, a dust-removal sticker and a lint-free microfiber cleaning cloth are included to wipe away streaks and dust prior to application. 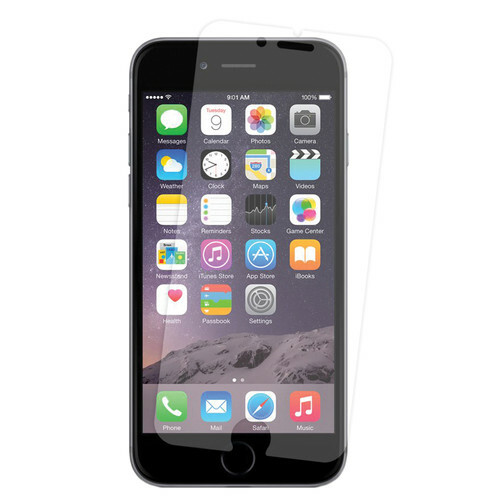 Box Dimensions (LxWxH) 7.4 x 3.5 x 0.1"
Clear Screen Protector Kit for iPhone 6/6s (2-Pack) is rated 4.5 out of 5 by 2. Rated 5 out of 5 by Anonymous from Great fit Easy to install, overall shape and all cut-outs match phone perfectly, comes with a cleaning cloth and a squeegee to remove air bubbles. A bit easy to get smudges on it, but also easy to clean, and still better than a bare screen. Would definitely recommend.